2. In a large saute pan, cook onion and garlic until soft and fragrant. 4. Add artichoke hearts, stirring well. Season with salt, pepper, and red pepper flakes, if desired. 5. Once the spinachoke mixture is cooked through, remove from heat. 6. In a food processor, combine cheeses and blend until smooth and creamy. 7. Combine spinachoke mixture and cheese blend in a separate bowl. 8. 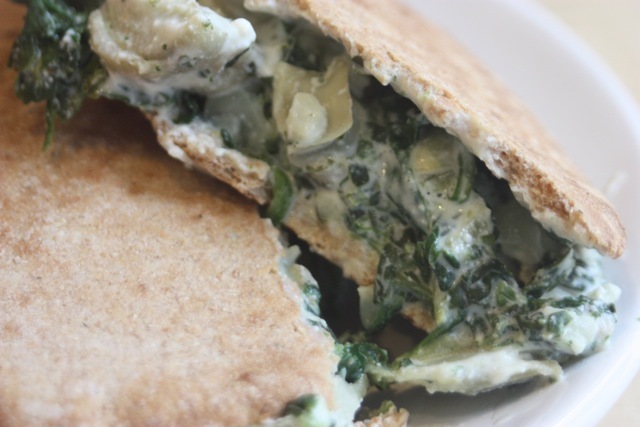 Cut a slit in each pita and stuff with about 1 cup of the spinachoke-and-cheese blend. 9. Bake pitas for 10-15 minutes, then enjoy!